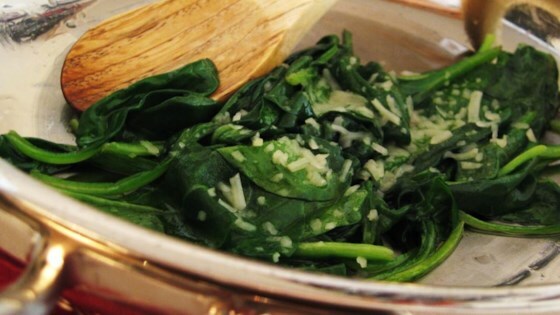 "Fresh spinach is cooked in olive oil with garlic salt and Parmesan cheese in this recipe." Heat the olive oil in a large skillet over medium heat. Add the spinach to the skillet and cover; allow to cook 5 minutes. Stir in the garlic salt and cover again for another 5 minutes; remove from heat. Sprinkle with Parmesan cheese to serve. See a few simple shortcuts for making easy creamed spinach. Exactly what the title says. Made this but substituted 2 minced cloves of fresh garlic for garlic salt, and added some previously-cooked chicken. Delicious! Really easy and great flavor! Instead of garlic salt I used fresh garlic and added a little sea salt. It was perfect over spaghetti. Quick, easy and very good. I used fresh garlic as others suggested. My husband is not a big spinach fan but LOVED this recipe. I will make again...soon!